Idea Store Bow 1 Gladstone Place, Roman Road Bow, London E3 5ES Tel: 020 7364 4332 Facilities: Learning labs (Classrooms), café, study space, public PCs, bookable foyer space, ergonomic equipment (available upon request) and free public Wi-Fi access. Accessibility: Disability access,in most of the building, accessible computing peripherals. 10 PCs and desks, PC, printer and scanner available, DVD/CD player, smart board/projector, speakers, air conditioning. £32+ VAT (Concessions available, please call for details). Chairs, tables, PC, DVD/CD player, smart board/projector, speakers, Flip Chart, air conditioning. £32 (Concessions available, please call for details). ÂŁ32 (Concessions available, please call for details). Idea Store Canary Wharf Churchill Place London E14 5RB Tel: 020 7364 4332 Facilities: Learning labs (Classrooms), Ergonomic PC available for use, study space, public PCs and free public Wi-Fi Access. Accessibility: Disabled access, 2 outdoor lifts, induction loop at help desk, accessible computing peripherals. Tables, chairs, PC, DVD/CD player, smart board/projector, speakers, flip chart, air conditioning. 18 - Can be merged with Lab 2 (which would accommodate up to 36 seated). 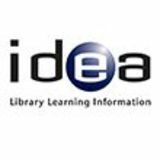 Idea Store Chrisp Street 1 Vesey Path East India Dock Road London E14 6BT Tel: 020 7364 4332 Facilities: Learning labs (Classrooms), study space, Ergonomic PC available for use, public PCs and free public Wi-Fi access. Accessibility: Disabled access, escalator, lift, book magnifier for people with visual impairment, accessible computing peripherals. Tables, chairs, flip chart, PC, Smart board/projector, whiteboard, speakers, DVD/CD player, air conditioning. 18 - Can be merged with Lab 4 (which would accommodate up to 36 seated). 18 - Can be merged with Lab 3 (which would accommodate up to 36 seated). 14 PCs on desks, 16 chairs, (PC desks have a folding mechanism which allows PCs to be hidden inside the table, this enables the lab to be used as a normal classroom as well as an IT lab) smart board/ projector, whiteboard, speakers, DVD/VCR/CD player, air conditioning. ÂŁ32 + VAT (Concessions available, please call for details). Idea Store Whitechapel 321 Whitechapel Road London E1 1BU Tel: 020 7364 4332 Facilities: Learning labs (Classrooms), dance studio, training room, café, terrace, study space, public PCs and free public Wi-Fi access. Accessibility: Disabled access, book magnifier for people with visual impairment, accessible computing peripherals. Chairs, tables, smart board/ projector, PC, DVD/CD player, speakers, flip chart. Up to 70 in 'conference' layout, or 30 in 'boardroom' layout. £58 (Concessions available, please call for details). Dance floor, PC, DVD/CD player, music speakers, smart board/projector, wall mirrors, chairs, men and women changing rooms and shower facilities also available. £58 + VAT (Concessions available, please call for details). Chairs, tables, laptop, projector and screen. 120 on chairs, 40 at tables. £115 (Concessions available, please call for details). Chairs and tables provided on request, smart board/projector, PC, DVD/CD player, speakers, flip chart, air conditioning. Up to 50 in 'seminar' layout, or up to 30 for meetings with chairs and tables. £48 (Concessions available, please call for details). Tables, chairs, smart board/ projector, PC, DVD/CD player, speakers, flip chart, air conditioning. 20 - Can be merged with Lab 3 (which would accommodate up to 50 seated). 20 - Can be merged with Lab 2 (which would accommodate up to 50 seated). 15 PCs, PC, DVD/CD player, smart board/projector, printer, scanner, flip chart, speakers, air conditioning. 8 chairs, table and coat hangers. £18 (Concessions available, please call for details). 4 benches (chairs on demand). The Shadwell Centre 455 The Highway London E1W 3HP Tel: 020 7364 5684 Facilities: Classrooms, IT Room, dance studio, hall, kitchen, gym and café. Accessibility: Disabled toilet on Ground Floor, no lift access available to upper floors. Whiteboard, projector, speakers, chairs and tables available. 30 with tables, 60 seated. Chairs, tables, smart board/ projector, speakers. Depends on purpose or use, up to 60 seated. Exercise equipment, smart board/projector, speakers. Tables, chairs, smart board/ projector, speakers, flip chart, whiteboard, PC, speakers, airconditioning, coat-hangers. Induction loop. 20 on chairs, 16 on tables and chairs. Tables, desk, chairs, flip chart. Table and chairs for 10 people, smart board/projector, speakers, flip chart, book shelf. Facilities for practical use only. Industrial standard cookers and cooking equipment, 2 TV projectors, speakers. Overhead camera for tutor demonstrations. Tables, chairs, smart board/ projector, speakers, flip chart, whiteboard, PC, DVD/CD player, speakers. 30 seated. (24 with tables). ÂŁ32 Concessions available, please call for details). 30 seated. (17 PC access). ÂŁ58 + VAT (Concessions available, please call for details). 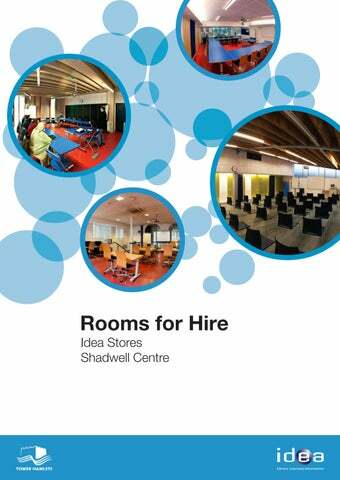 Rooms for hire in Idea Stores and Learning Centres. Rooms for hire in Idea Stores and, Learning Centres.